Now in our Sew Along of the Nappy Bag we're onto the base gusset which will join together with the zipped gusset to form the one gusset. This post is picture heavy! 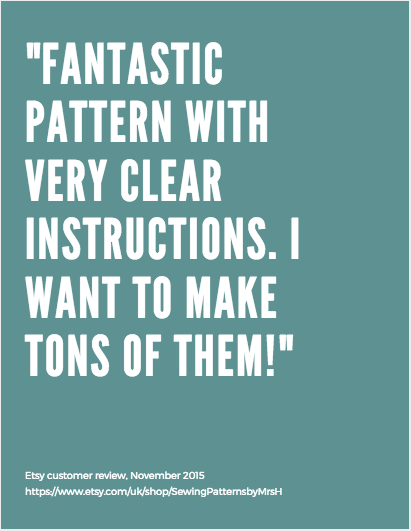 I spent many, many, many hours developing this gusset method. 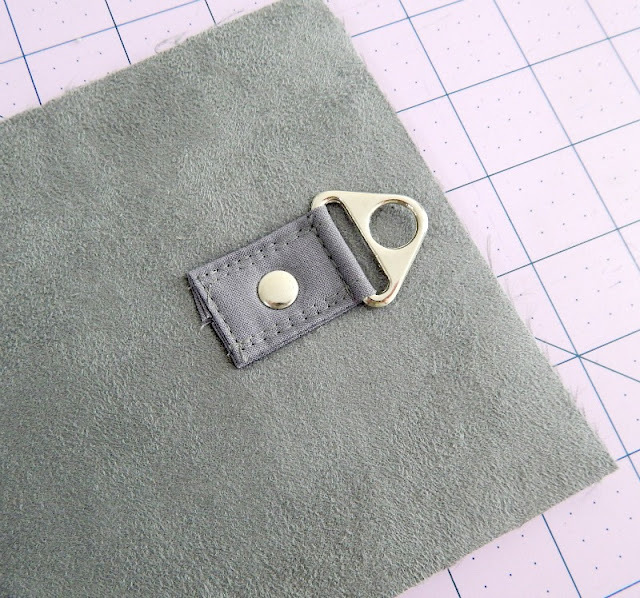 I wanted to be able to create bags with a zipped gusset like this that didn't require hand stitching the lining to the zip, or applying binding to exposed seams. I hate both hand stitching and binding as many of you already know. 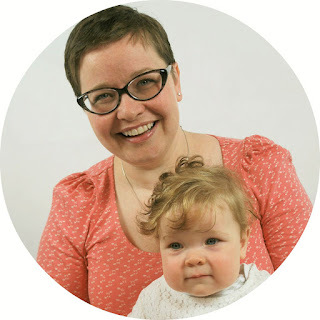 It took me days to work this out and I nearly pulled my hair out, however Sara from Sew Sweetness encouraged me to keep going (she probably doesn't remember this!) and ta-da, the method was born. 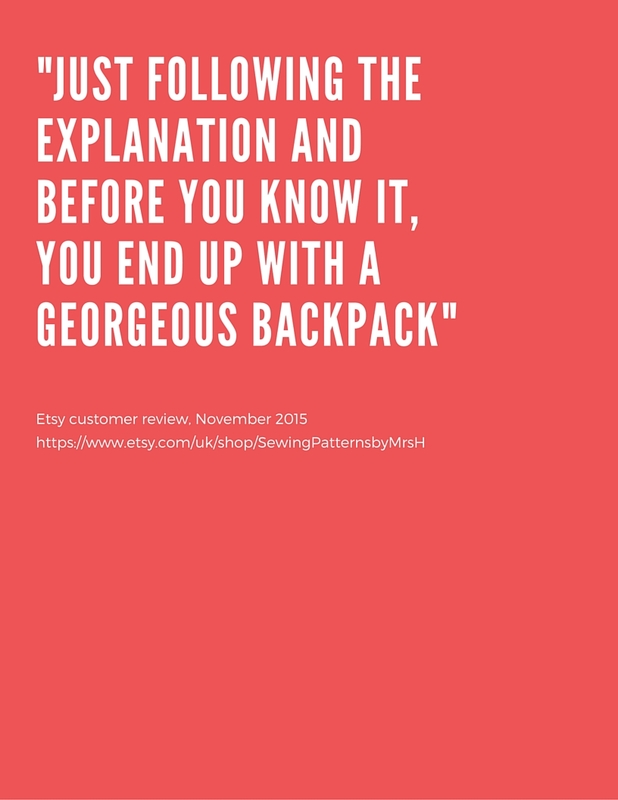 Although I can't claim it's unique and original, as I'm sure there's nothing unique and original in the world of sewing any more, I don't know of any other bag pattern designer who used this method before me. So folks, hopefully those of you who hate hand stitching and binding too can appreciate the time that went into the research and development, just remember, you saw it here first! Right, to business, first of all before we can sew our gussets we need to make sure they've got everything that they need. For the base gusset that's side tabs (F) and elastic side pockets (L). 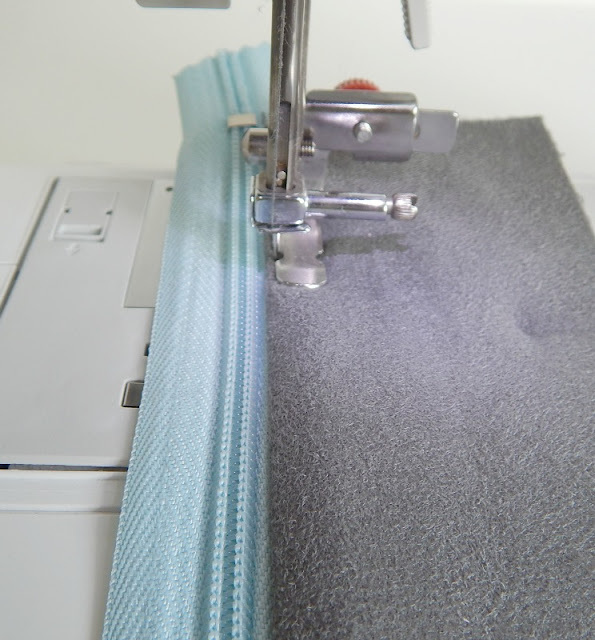 If you're quilting your heavy stabiliser to your base gusset, go ahead and make sure that's done before you do the rest of the steps in this post. 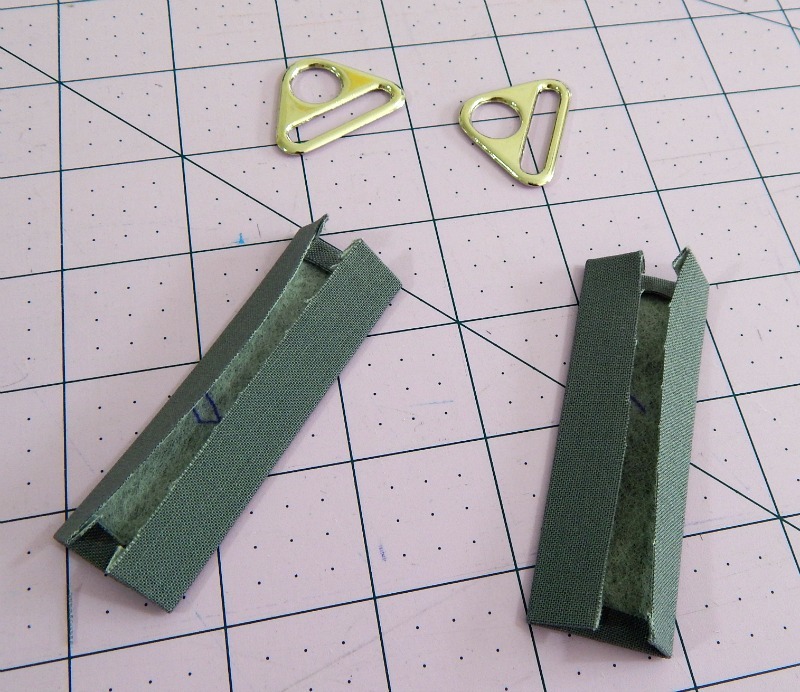 I'm using triangular rings for the sew along, a truly innovative bit of bag making kit! Fold & press each short end in 1/4" (6mm) so that the raw edges are hidden. 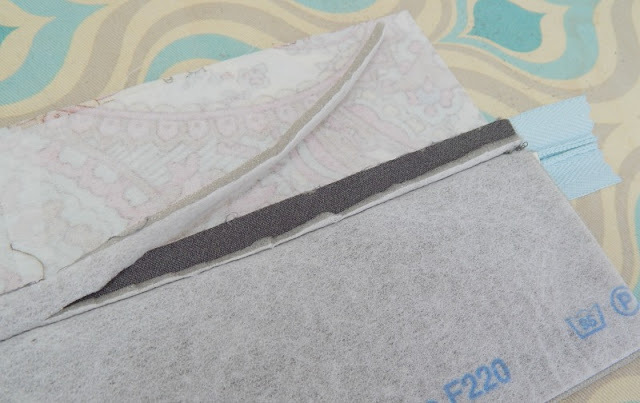 Fold the tabs in half and finger press to give you a centre crease, then open up and fold the raw edges in to the centre crease. 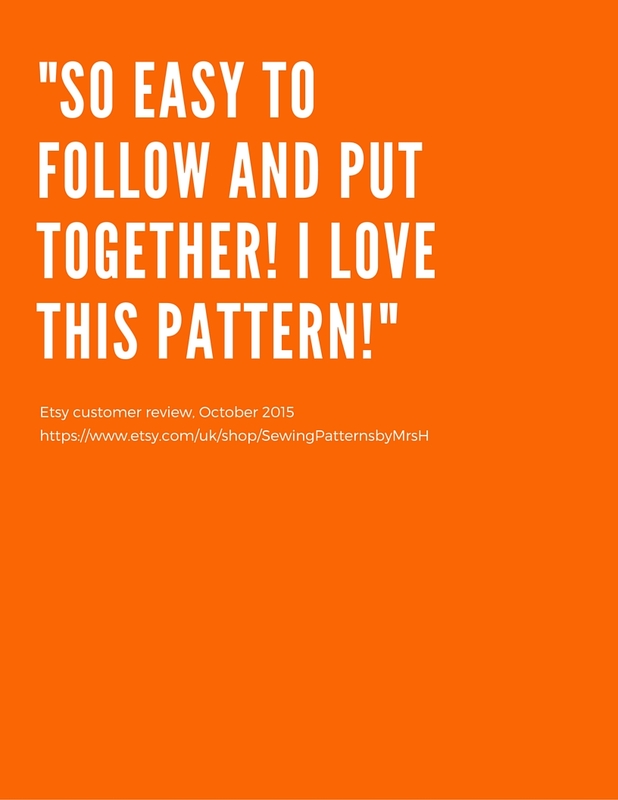 By just doing this creasing it reduces bulk when sewing it to the base gusset. 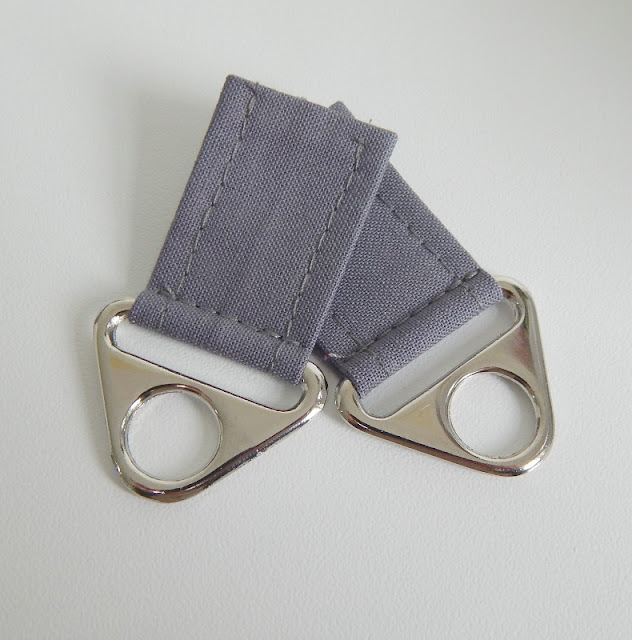 Thread the triangular (or D) rings onto the tabs to the centre and stitch using your zip foot as close as you can get. 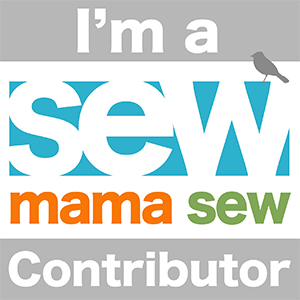 I use my adjustable piping/zipper foot. It's excellent for getting really close! Repeat for the second and you've two side tabs. 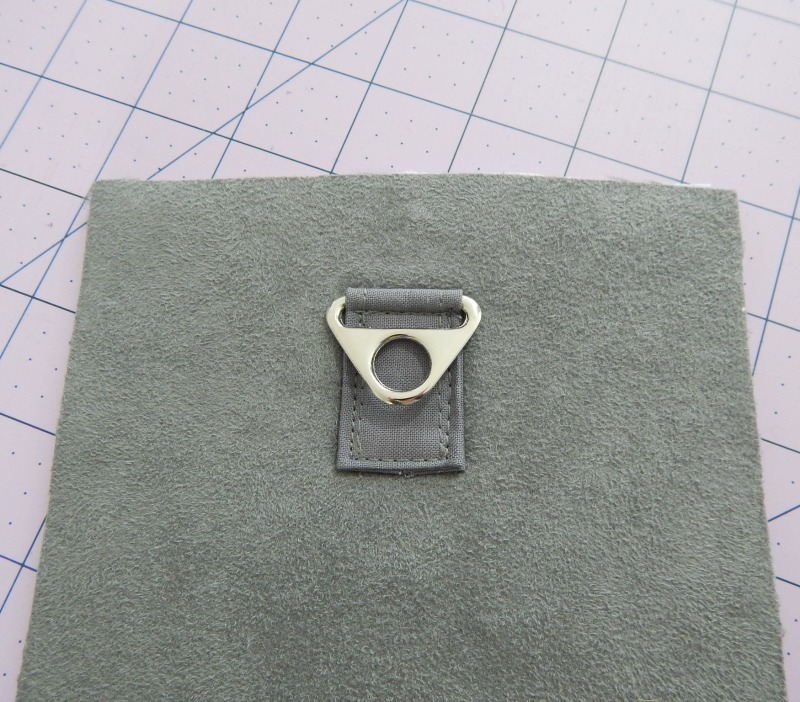 These need to be placed with the top of the tab, not the ring, at 1" (2.5cm) from the top of the base gusset and in the centre. I stitched around the four sides of the tab, you could do a cross in a square to secure it if you like. I added a rivet in the centre of the tab to make sure it was definitely secure. These bags could be carrying a lot of weight, especially if you're using it as a travel bag! If you would like to add feet to your bag, which is not in the pattern, then you will need to make the markings and holes for them now. I'll be using 6 feet for a bag of this size. Draw a line across the width of the base gusset at the centre and one 6" (15.5cm) either side. 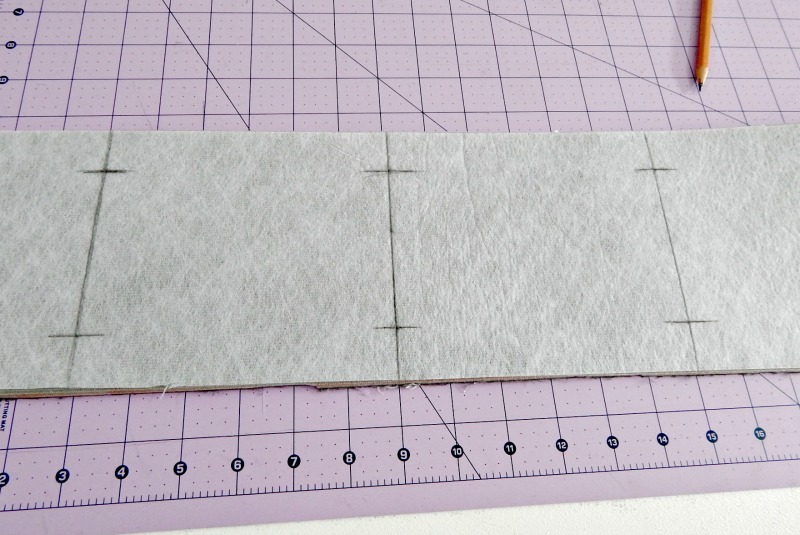 Then make lines crossing those at 1" (2.5cm) from each long edge. Using an awl make holes where the two lines meet and do the same for all 6 holes. You can forget about the feet now until just before we close the turning gap when we'll insert a base and the feet. If you haven't already purchased your bag feet, there's still time to do so. If you are completing the elastic side pockets and internal bottle holders, please follow instructions 50) - 59) in the pattern. I've left my elastic side pockets off so that you can see the happenings a bit clearer. The side pockets will go over the side tabs, so don't worry if that's the case for you. If you need more help with the side pockets and elastic bottle holders, please feel free to ask in the facebook groups! I've added an elastic bottle holder to my bag for my bottle of water, you don't need to be carting babies bottles to need a bottle holder! Up next is the zipped gusset, the most exciting part! 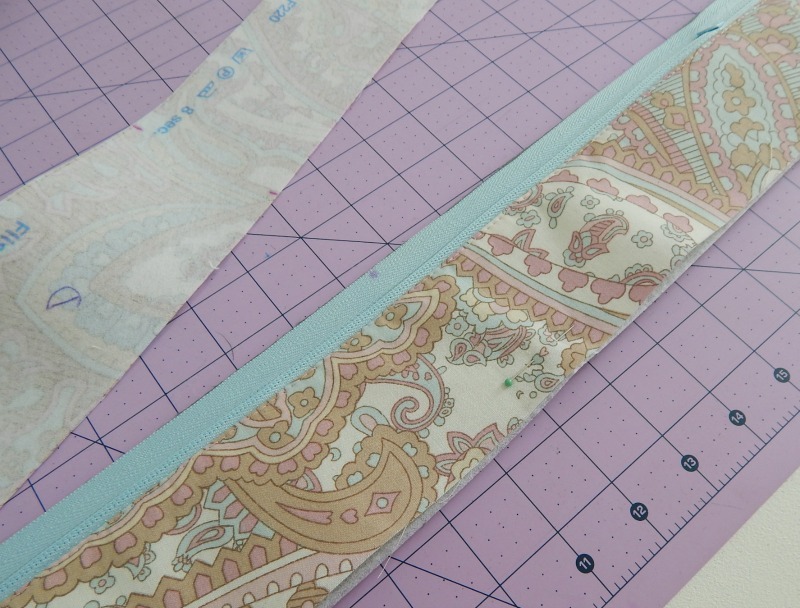 I'm using a Sewline glue pen to attach my zipper but you can use wondertape if you have it. Mine gums up my needle though so I stick to my pen! 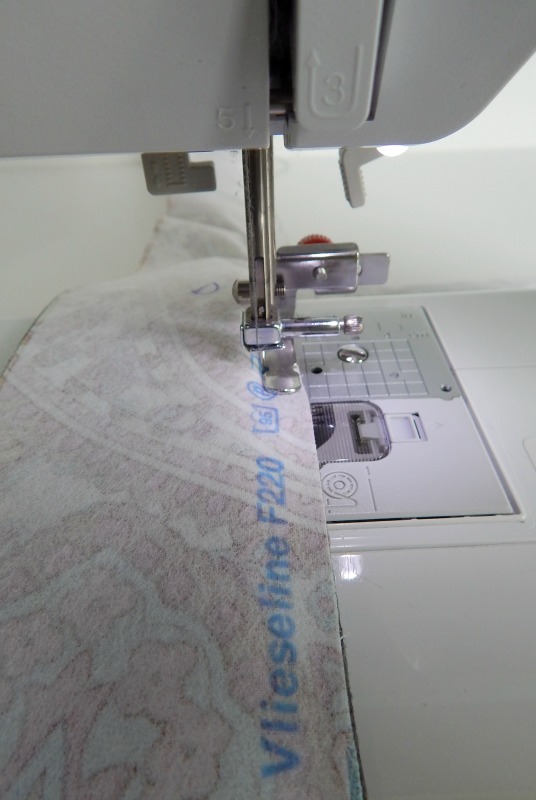 If you haven't already marked the centres then do so now within the seam allowance with a pencil or a biro. Don't use a frixion or an air disappearing pen, you want these marks to stay! 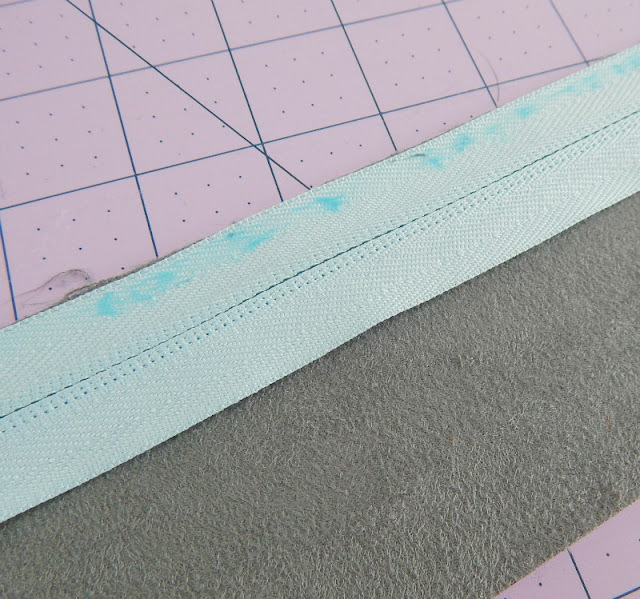 Pop a layer of the glue pen (or tape) within the seam allowance on the right side of one long edge of the outer zipped gusset then lay the zip right side down. 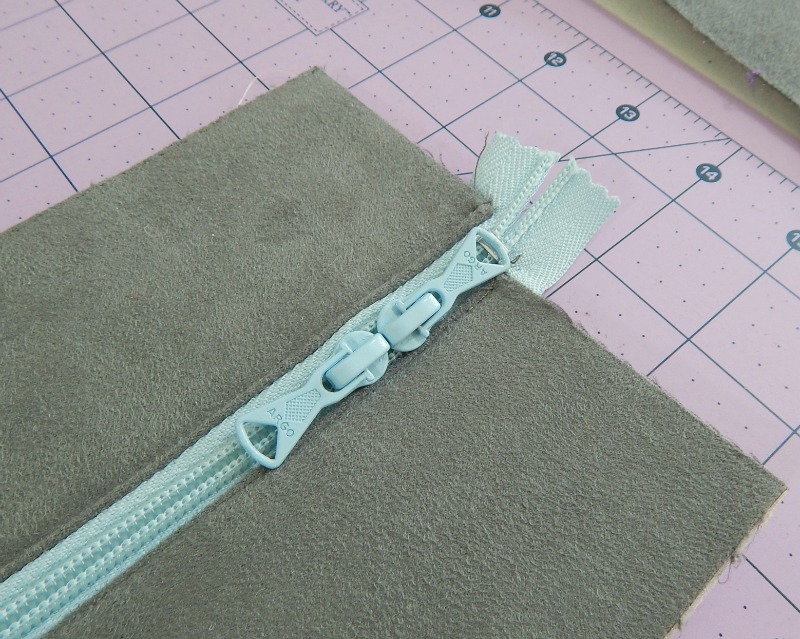 Add another layer of glue within the seam allowance of the zip. Matching up centre marks is really helpful with this step. Then lay the lining piece face down on top of the zip and outer. The long raw edges should be lined up. Now you can stitch through all three layers without them shifting too much. Unfortunately if you're using a very thick outer or one with a nap like mine you can find a bit of shifting but that can be trimmed later on. 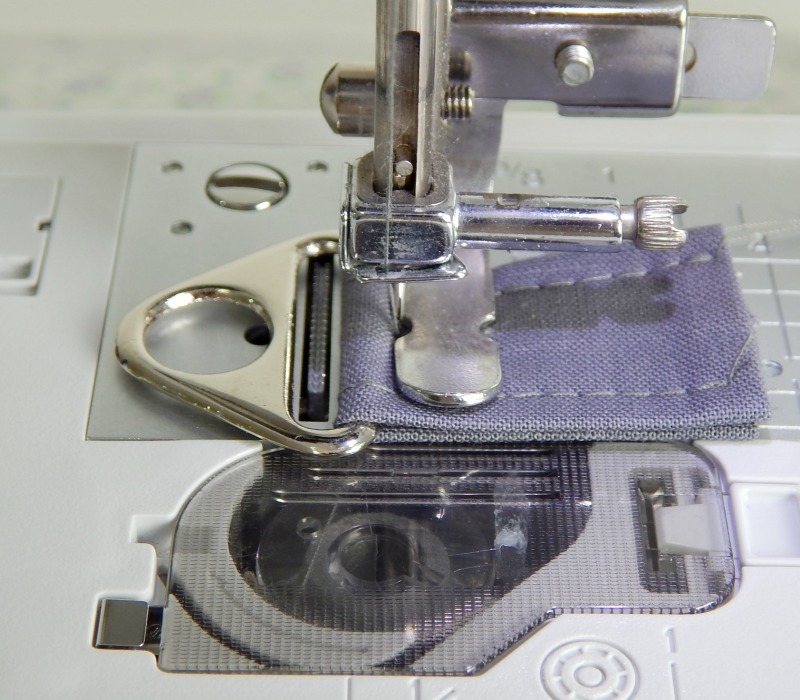 Trim the heavy stabiliser from the zip seam. I'm using faux suede headliner and found the foam pulls off fairly easily. 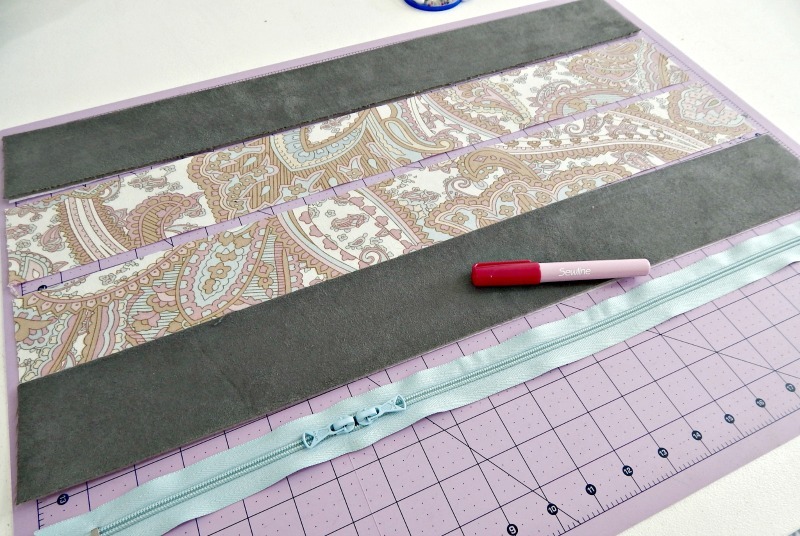 Turn the outer and lining so that the wrong sides are facing and then press well. If your outer is particularly thick you may wish to pin the lining to it lining up raw edges to help it stay flat for top stitching. To repeat for the other side do exactly the same laying the outer face up, zip (with half attached) face down and then lining face down on top, once again matching centre marks. If your zip has a little tail at the end, leave that, don't trim it! Measure the width of the zipped gusset with the base gusset and if it's slightly wider then trim it down to be the same width. Phew, how was that? Your gussets are all prepared ready to be joined up! Check back tomorrow for joining your gussets, in the meantime, please do ask any questions you have in the facebook groups! Perfection! Everything you touch turns out perfectly!! Wow.